Just another day at the office? Not quite for Princess Sydney. Our heroine spends the day charming her parents for treats and side stepping her annoying brother every chance she gets, all the while protecting the mean streets of Snoqualmie from her perch on high. Sydney is about to discover a new world full of friends, challenges, danger and the importance of family. Will she make it home in time for dinner? Does she realize she’s actually a dog? Inquiring minds want to know. One thing is for sure, she is indeed a Princess and proud of it. Whether you’re a princess or not, it’s hard on the mean streets for a poo, cockapoo that is. 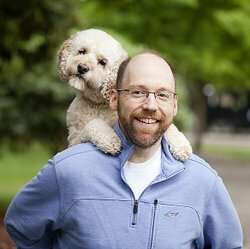 Chris Minich is a writer living in Snoqualmie Washington. He enjoys spending time with his wife and their two precocious dogs, Sydney and Buddy. Chris is also a die hard Seattle Seahawks fan.